Shirts With Random Triangles: Jim Harbaugh And A 2017 Prospect Had A Wrestling Match Together. 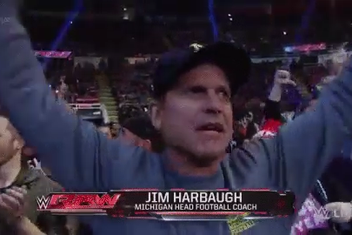 Details of the match are scarce, but Paea says that Harbaugh won the match. There's no word as to whether the match followed proper NCAA rules for wrestling, or if it was more like an old school NWA Texas Death Match.